You won’t find a reasonable scenario in any mock draft that has Kyler Murray falling to the sixth pick of this year’s draft. Yet, the Giants, with the sixth overall pick, had Murray in for a visit on Thursday. The visit was reported, and then Murray confirmed it with a post on Instagram, captured by NFL Media’s Mike Garafolo. That’s certainly interesting, given that the Giants have to replace Eli Manning and soon. But what is the point of Murray visiting the Giants? 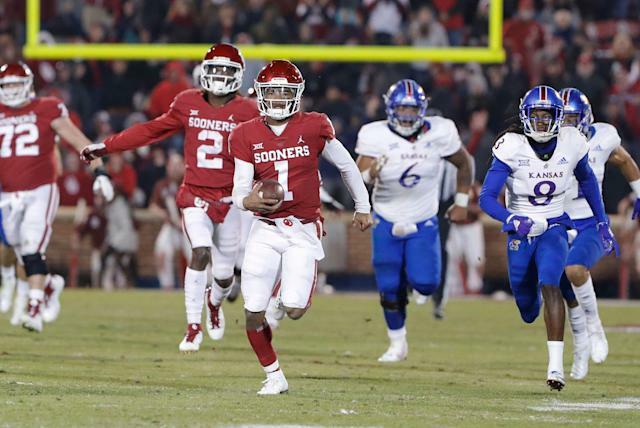 Why are the Giants meeting with Kyler Murray? Give the Arizona Cardinals credit for making the top of this draft interesting. While Murray going No. 1 overall to the Cardinals has been rumored since the NFL scouting combine, the Cardinals haven’t confirmed that. And they haven’t traded quarterback Josh Rosen, who they drafted No. 10 overall last year. The Giants have to know the Cardinals have been rumored to be interested in Murray; everyone interested in the NFL draft knows that by now. And they presumably understand that if the Cardinals don’t trade Murray, the most likely move is a trade down with a team that would draft Murray No. 1. And even in the unlikely scenario the Cardinals stay put and draft someone other than Murray, someone between picks 2-5 would likely either make a trade or take Murray themselves. So, back to the question: What’s the point of the Giants bringing in Murray? It’s possible the Giants are just doing their homework, just in the one-in-a-thousand chance Murray falls to No. 6. Or they’re taking advantage of a small window to meet with a player who could end up being a fixture in the NFL for a long time, even if they don’t anticipate taking him. Or if you want to let your mind wander, perhaps the Giants are considering trying to make a trade up with Arizona? Otherwise, meeting with Murray seems like a waste of time. Even in the entirely unlikely scenario Murray falls to No. 6, the Giants wouldn’t need a pre-draft meeting with Murray to know that’s a steal. News of pre-draft visits are overblown. Because a team meets with a player means very little. There are many tales of players being drafted without ever having contact with their new team beforehand. Yet, Murray spending time the Giants seems a little more newsworthy than most other visits.